The 2010 14th Edition of the CMP Competition Rules for Service Rifle, Service Pistol and As-Issued Military Rifle shooting has just been released. These new rules go into effect immediately. The new rulebook can be downloaded from the CMP website. 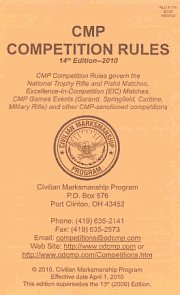 Printed copies of the new rules, which can be purchased from the CMP for $3.00 each, will be furnished to each match sponsor and National Matches competitor. Share the post "CMP Issues 2010 Service Rifle and Service Pistol Rules"